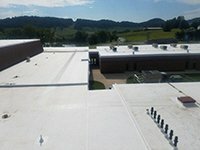 Many people do not realize that roof manufacturers require the proper care and maintenance of their roofs before they will approve a warranty claim. For example, roof drains need to be cleared of debris in order to ensure the proper drainage of water and prevent future leaks. Medford Roofing understands that roof costs are a major concern of building owners and property managers. With a comprehensive roof inspection and maintenance plan, we are able to extend the life of your roof. A well-maintained roof can last many years beyond its warranty period. By being proactive instead of reactive, you will increase your overall roof savings and decrease life cycle costs. Furthermore, a clean roof will reflect the suns rays more effectively and help you save money on energy costs as well.